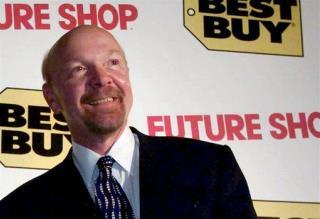 (Newser) – Best Buy founder Richard Schulze wants back in. Schulze, who stepped down as chairman in June after news of ex-CEO Brian Dunn's affair broke, today offered to take the struggling company private at $24 to $26 a share, reports Bloomberg. That values the company at around $8.5 billion, which is 36% more than Friday's closing price. He made the offer in a letter sent to the company's board, in which he writes that reviewing the options he has for his 20.1% ownership stake "reinforced my belief that bold and extensive changes are needed for Best Buy to return to market leadership." Hopefully they'll curtail their tendency to outright lie to customers. They've been known to show screens A&B side by side to tout their screen calibration techniques. If you look in the back, one is connected with HDMI the other is connected with RCA cables. They also make false claims about the nature digital cables. They also lie about computer services. I can hardly even go into every story. They're on Gizmodo all the time getting busted by some savvy reader. Much of it, but not all, of it is related to the Geek Squad and claims they make to customers.